Looking at a headlight and checking the projected image I can get an immediate impression of just how much money and attention the manufacturer has invested in the light development department. You can't have a great bathroom if your towels are dirty. Just a few years ago we thought xenon was the future of lighting. Compared to H4 or H7 halogens it offers tremendous brightness, and used with modern reflector technologies and in projector and collector lens lighting units, it provides a beautiful beam. It offers uniform brightness over a wide area, while dynamic height control allows for an effective adjustment of what is a relatively small and lightweight lamp assembly. Of course there are good ones and bad ones. Some of these cannot align their adjustment with the diving and squatting of the vehicle, making me literally sick as the beam keeps bobbing on the road. Others adjust their height imperceptibly. As time went by we have found out that the life span of xenon lights – while theoretically long – is subject to a number of conditions, which has resulted in more and more youngish premium vehicles driving around with a blind eye. This should not come as a surprise since the system is highly complex. You have a transformer, an electronic ignition unit, and wiring or housing to keep them together. You need to place these carefully: high voltage has to be shielded from interference, and there's also the issue of shock protection in case of water ingress. Finally if a xenon headlight ever needs repair the bill alone is enough to make you blind even without looking into the beam. In the premium segment you will no longer find halogen lamps on anything but entry models. Xenon HID (high intensity discharge) technology has become the norm, usually employed in a projector assembly, while you can add the option of LED lighting. There is nothing new about LED. Light emitting diodes have been around for decades but they have only been used in automotive headlamps for a few years. Mind you, these LED's are altogether different from those used in your flashlight or as a warning light on your instrument panel. The operating principle is of course identical, so is their appearance: looking into an LED you can see a small square pad, approximately 2-5 sq, mm in size. More and more often these are called LED chip modules, referring to the fact that the diode has been integrated into a single electronic unit no larger than the aforementioned square. Early LED's emitted what was an overly concentrated light beam, far narrower than the smallest of standard 55W incandescent bulbs. While this light source may have been bright it could not emit light in 360 degrees, and it had to be positioned in the focal point with extreme precision in order to make directional adjustment feasible. 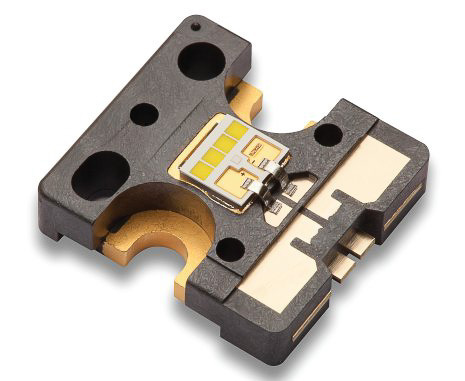 While LED chip modules have become widespread in recent years they would be of no use if it wasn't for the achievements of the plastics industry. As computer aided design and integrated manufacture have become more and more affordable it is now possible to produce a precise and concentrated enough reflector for each small diameter LED to allow an easier and more precise positioning for them. There has also been significant progress in the field of metalised reflectors on a plastic carrier. This latter factor may be the most important one, since having a reflector with 20% less reflective capacity will reduce the intensity of the beam by almost 40%, as a result of inferior reflection and an increase of diffused light – in other words there is less light and even that is directed less properly. Combine this with an ill-designed reflector with the light source slightly out of focus and you will have an LED headlight that gives off less light than a simple H4 halogen. This could have been possible 20 years ago, but at costs prohibitive to the automotive industry – and NASA just didn't need LED headlights on the Endeavor. 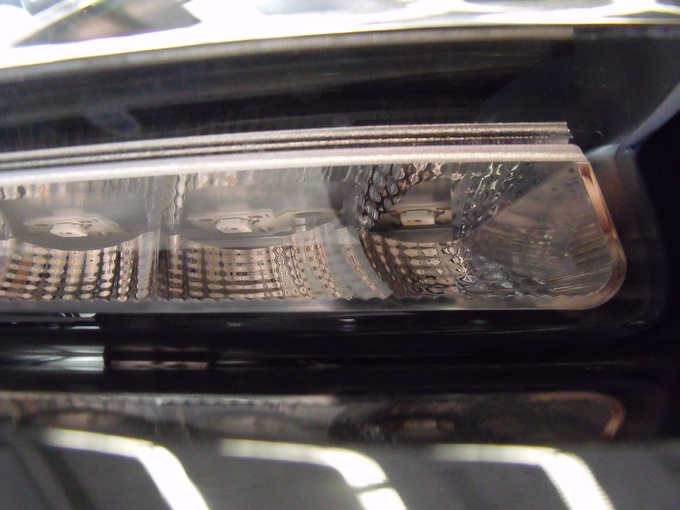 After LED has become a commonplace in rear light assemblies, manufacturers took a deep breath and began launching their LED headlights. Which brands pioneered the technology is a subject of debate, and to be politically correct I'll just say Audi was among the first with its R8, A8 and new generation A6 models, BMW with the new 6 series (F12/13), while both the Cadillac Escalade and the Lexus LS600H launched their first LED headlights overseas more or less the same time. It is no secret that one of the major advantages of LED lighting is that designers can work more freely on the shape and size of the headlamp unit. This is very important given how they are forced to keep coming up with novel ideas and constant upgrades. LED lighting is also a highly powerful marketing tool – can you recall a recent sales brochure or even a press photo for the Audi A6 which did not feature LED headlights? 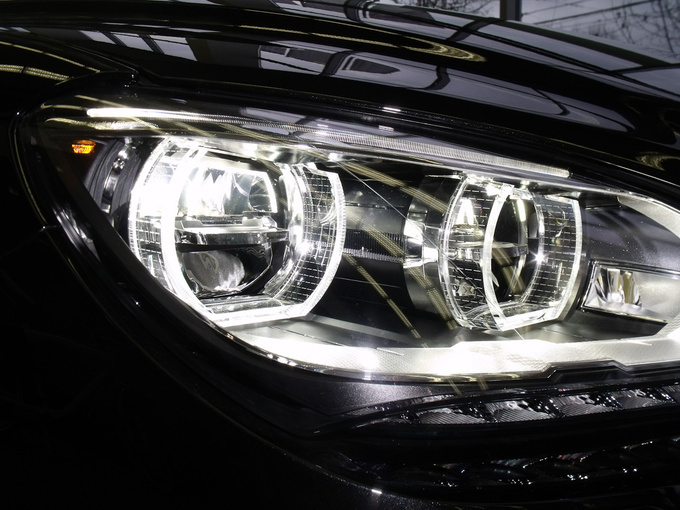 BMW and Audi are taking different routes in LED headlight technology. The new BMW 6 series employs a bridge of LED's with their mirrors directed towards the freeform parabolic mirror of the main reflector, with the top segment of this latter reflector providing low beam, and the bottom segment the high beam. Audi, on the contrary, uses several small projector style units, each employing a single LED with a beam pattern defined by the reflector and the collector lens. From a purely technological viewpoint Audi's system is extremely well thought out and is capable of varying and adapting the projection beam as a function of traffic and ambient light conditions much better than the headlight used by BMW. Hella has been a leader in developing LED light assemblies, while actual LED light sources were pioneered by Philips and Osram. Adaptive xenon headlights used various diaphragms operated by actuators and positioning motors to define the beam pattern. 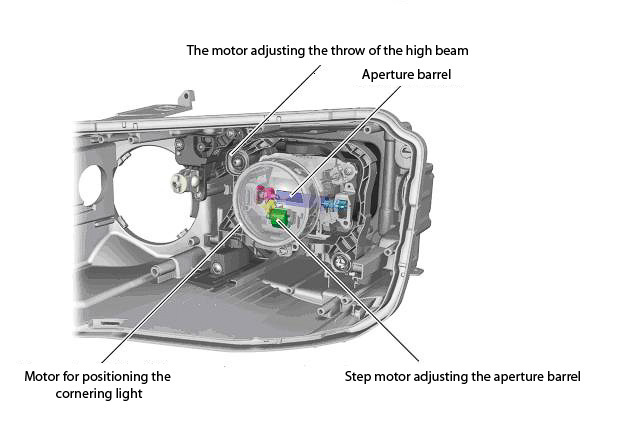 Later xenon systems, such as the adaptive light unit from Audi, replaced these diaphragms with a variable diameter cylinder rotated in front of the light source. This allowed the adaptive headlight to create multiple beam patterns and adapt to the conditions and demands. 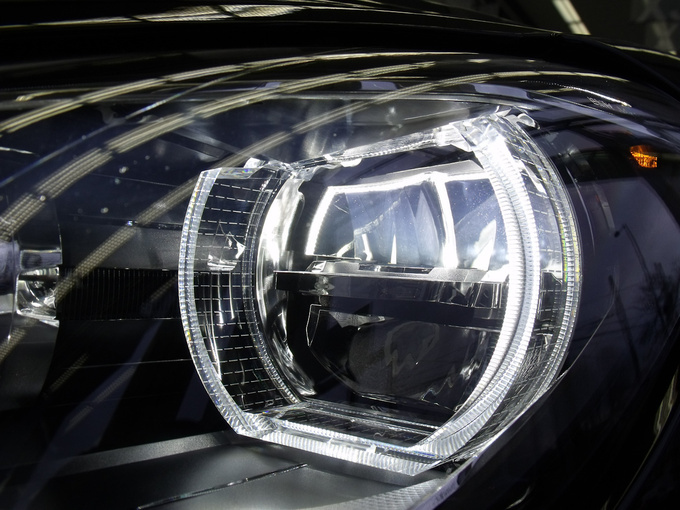 Besides compensating for squat or dive, certain headlights could also create patterns ideal for high beam, low beam, urban lighting and cornering light. Diaphragms and reflectors are operated and positioned by actuators and electromagnets. This yielded a complex system, both electronically and mechanically, and while such systems are still functional, regular wear and oxidation may result in inaccuracies and malfunction which may render these lights not only dysfunctional but potentially dangerous. Manufacturers are aware of this risk and therefore integrate their headlights with the OBD and bus networks, just like all adaptive units. LED lights work along a different principle. Diodes positioned behind the optics are surrounded by far less mechanical components. Various beam patterns are generated by switching certain LED's on or off, so basically these lights can create any sort of beam, similar to the modern projectors in movie theatres. Combine this with existing camera-based safety systems such as Night Vision and we enter a brave new world of adaptive lighting which offers options that were simply not possible with xenon headlights using diaphragm systems. 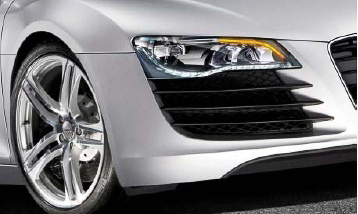 LED lights by Audi are equipped by Altilon light sources manufactured by Lumileds, which are actually emitters adapted to modified operating conditions. Each projector unit has a LED chip module which can be individually controlled (on/off/power level). Freeform parabolic reflector headlights (such as the one used on the BMW 6) usually contain 3 to 5 light sources but by 2013 most manufacturers would like to limit themselves to no more than three (preferably two) LED's for static low beam. Of course for adaptive functionality you will need more LED's. 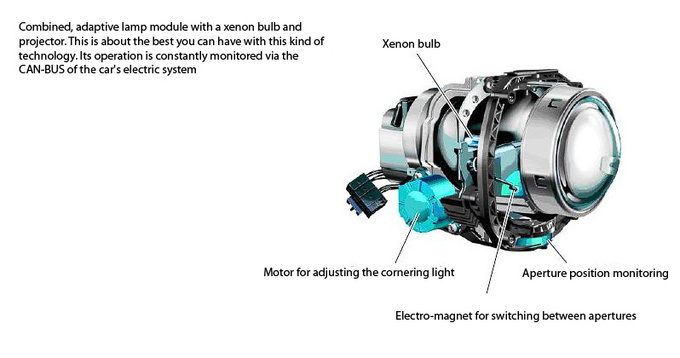 Current systems have an energy consumption of 19W per side, in contrast to the 35W of xenon and 55W of incan lights. Upon activation xenon lights will temporarily take up ten times their nominal consumption, whereas LED and related electronics have a more balanced consumption. One drawback of LED technology is intensive heat generation which means effective heat sinking solutions must be applied. This is usually catered for by cooling surfaces exposed to wind, while Audi has also installed a cooling fan within its light unit. Another advantage of LED's is that by applying PWM (pulse width modulation) one can achieve stepless intensity control. Pulse width modulation does not change the colour temperature of the light. This means a single row of LED's can be used as low beam, running at lower power, and when you switch on the indicator, the same diodes can change both intensity and color, and start blinking, as seen on the new generation Audi A6. LED's offer instantaneous power build-up, there is no delay, and the temperature of the light is closer to natural sunlight than anything we have seen. Soon LED systems should be able to blur the rather disturbing sharp boundary between light and darkness, giving users a transition between the two. Another feature that could be easier on the eyes is the gradual (5-8 seconds) transition from low beam to high. This puts less strain on the natural adaptive ability of the eye, and is also kind to oncoming motorists. Unfortunately using PWM to control the power level of the light does have certain drawbacks: both front and rear lights, as well as the backlit control knobs on the steering wheel will appear to flicker if you move your head without blinking. Some people are more sensitive to this, others less so, but it is visible to everyone. Some people go nuts driving behind a car with LED rear lights, while others can only notice the flicker if they are specifically looking for it. Glancing into your rear view mirror you may have noticed that some LED headlights seem to vibrate and move about. Now you know why. The degree of visible PWM flicker also depends on how sophisticated electronics the light source uses. Before bidding farewell to xenon lights, however, let us not forget that they are still the most powerful homologated and standardized light sources available for road use. Xenon bulbs are more expensive than traditional incan bulbs, their life span is far from unlimited, and control electronics also cost a lot – not that LED lights are more affordable. To ensure high precision manufacturing, projector type headlights are usually constructed with main reflector and LED-set as a single unit. However the reflector is part of the light housing assembly meaning everything has to be replaced. 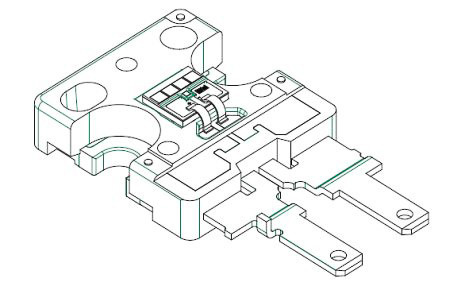 In certain cases you can retain electronic control gear or cooling subsystems but in order to keep manufacturing costs down these are also going to be integrated for lower segment products. Considering the rate of automotive amortization, if you buy a car with adaptive LED lights today and then rear-end someone in fifteen years' time, damaging your light assembly, your vehicle will most certainly be a write-off. 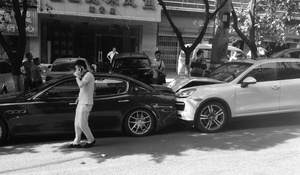 The wife driving a Porsche started chasing her hubby then crashed into the Italian luxury car.